Doha, 5th Nov. 2012 – Emir of Qatar, His Highness Sheikh Hamad bin Khalifa Al Thani, visited the award-winning 1001 Inventions show in Doha today, accompanied by HH Sheikha Al-Mayassa, Chairman of the Board of Trustees of the Qatar Museums Authority. 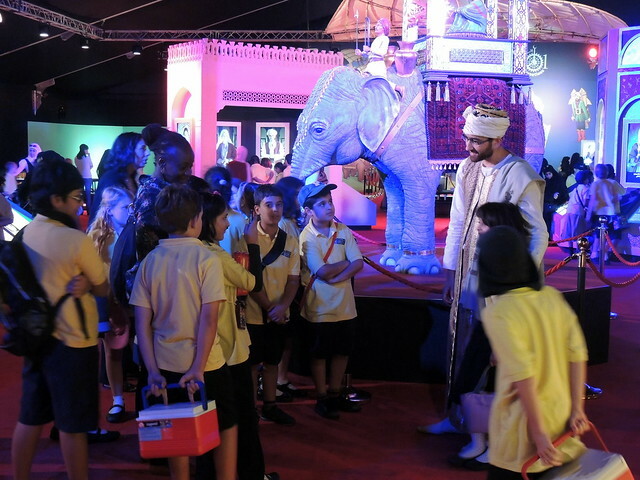 The Emir’s visit to the blockbuster exhibition, based in the city’s Museum of Islamic Art Park, gave him the opportunity to witness first-hand the show’s enormous popularity with local children and adults. Opened by HH Sheikha Al-Mayassa on the 17th of October, just three weeks ago, the 1001 Inventions attraction has already welcomed more than 50,000 visitors keen to explore astounding scientific achievements from “The Golden Age” of Muslim civilization. 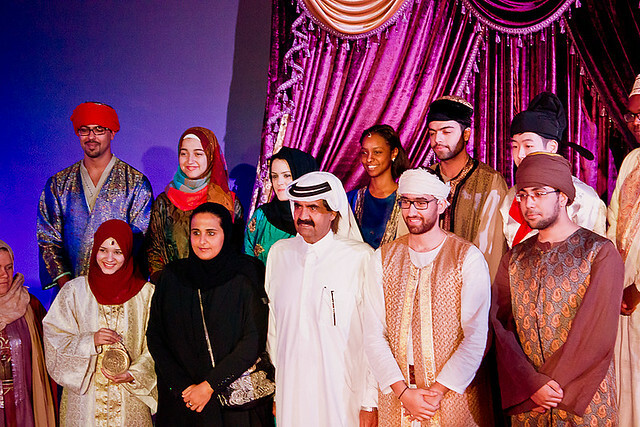 Emir of Qatar, HH Sheikh Hamad bin Khalifa Al Thani, 1001 Inventions Exhibition Explainers. Ahmed Salim, Producer and Director of 1001 Inventions, commented: “We’re delighted that His Highness, the Emir, took time out of his busy schedule to meet the team behind 1001 Inventions and see first-hand our Qatari fans enjoying our world-class interactive science show. 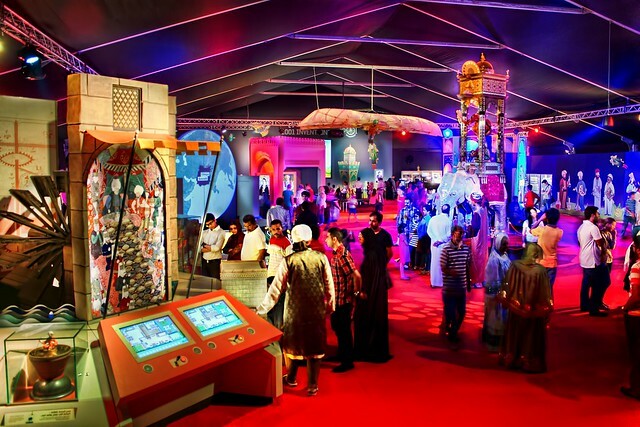 The 1001 Inventions show opened in the Qatari capital, Doha, on the 17th of October 2012 and will welcome visitors, free of charge, at a purpose-built marquee in the Museum of Islamic Art Park until the 12th of November 2012. Its sister exhibition, Arabick Roots, which opened at the same time in the Museum of Islamic Art building, will enjoy a three-month residency until January 2013. The science heritage exhibitions were brought to Doha by Qatar Museums Authority and the Museum of Islamic Art, and in partnership with Qatar Shell. 1001 Inventions is a leading international science and cultural heritage brand that has reached over 70 million people through its award-winning educational programmes, blockbuster exhibitions, films, books and international events. In 2011, following highly successful residencies in London and Istanbul – which secured almost a million visitors – our English language exhibition was crowned Best Touring Exhibition of the Year at the Museums and Heritage Excellence Awards. 1001 Inventions has drawn millions of visitors at blockbuster residencies in London, Istanbul, New York and Washington DC amongst others. At London’s Science Museum, 400,000 visitors attended the exhibition – more than five times the original estimate – including Royalty, Heads of State, Ambassadors and government representatives. During a seven-week stint in central Istanbul, 450,000 came to see 1001 Inventions making it more popular than historical attractions like the Topkapi Palace and Hagia Sofia. For its US debut in 2010, the blockbuster show opened at the prestigious New York Hall of Science, where it welcomed almost 300,000 locals and tourists. The following year, a further 500,000 people saw the exhibition at the California Science Center in Los Angeles, where it was opened by US Secretary of State Hillary Clinton. The English-language version of the exhibition is currently attracting large crowds in the US capital, Washington DC, where it is hosted by the National Geographic Museum. For further information about the 1001 Inventions initiative, images, video etc. please contact us. Interviews are available on request. Images for media usage can be downloaded from our official website our official pictures. 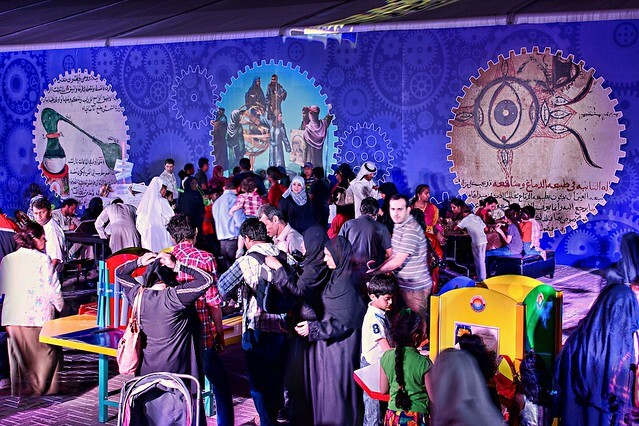 1001 Inventions is an award-winning international science and cultural heritage brand reaching over 70 million people. The 1001 Inventions brand has received recognition from industry leaders, statesmen and academics from around the world. In 2011, 1001 Inventions was declared the World’s Best Touring Exhibition by the Museums and Heritage Excellence Awards in London. The exhibition’s introductory film “Library of Secrets”, starring Sir Ben Kinglsey, has been downloaded more than 20 million times and won more than 20 industry awards including “Best Film” recognition in Cannes, Los Angeles and at the New York Film Festival. In 2010, 1001 Inventions was presented with the Google-sponsored Science and Technology Award by HRH Princess Badiya bint El Hassan at the Mosaic Talent Awards. To date, the interactive 1001 Inventions exhibition has attracted almost three million visitors during its blockbusters residencies in London, New York, Los Angeles, Istanbul, Abu Dhabi, Dhahran and Washington DC. The exhibition’s best-selling companion book, now in it’s third edition, has sold more than 200,000 copies and been translated into Arabic and Turkish. 1001 Inventions is supported by the UK-based Foundation for Science, Technology and Civilisation(FSTC), an international network of academic experts, as its Global Knowledge Partner. Additional support comes from the Abdul Latif Jameel Community Initiatives (ALJI), philanthropic arm of the ALJ Group of companies, which serves as the Global Strategic Partner of 1001 Inventions. 1001 Inventions is based on two decades of research by more than a hundred leading academics and educationalists from around the world. The content of the 1001 Inventions exhibition was reviewed and approved by an independent panel of academics from the London Science Museum’s and was also reviewed by academic experts retained by California Science Center. Further information is available from the official website www.1001inventions.com/references. Doha school children visiting 1001 Inventions exhibition.